FREE again for a limited time! Add a personal touch to your emails with Artmail, an app for writing and sending handwritten notes. This app is not billed as an educational app but it could/should be. 🙂 The app features several choices of stationery plus the option of using your camera to create a unique background. The writing is a brush style (similar to a fountain pen) with several color options. But the best part of this app is the scaling feature – which makes this app great for kids. Users can fill up the entire screen and the app automatically shrinks the word/words to fit in a letter format. Subsequent words are shrunk to match the size of the other words. A red cursor can be moved around to change the location of the words. Little hands will be able to write thank you notes to grandparents or to add a note of explanation to a photo. In the classroom, teachers could use it is SO many ways – for good copies of their writing, to communicate with parents, as an exit slip after a lesson, etc. 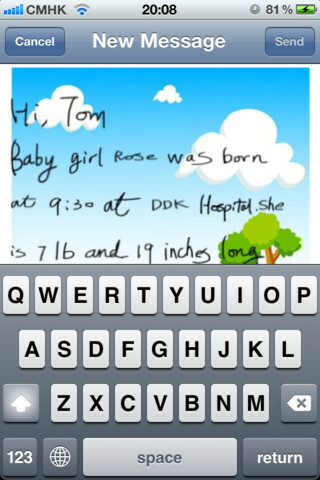 I LOVE that this app preserves the child’s writing!! Very cool app – perhaps an upgrade will include the ability to pull in pictures from the photo library which would make it even better! !